Somebody knows who invented Masala Dosa? Who, where and when? Do not treat it as a stupid question. If you have any idea, shoot it here. I believe dosa has its origins in Tamil Nadu. - First reference to Dosa occurs in the Tamil Sangam Literature from around 6th century AD. 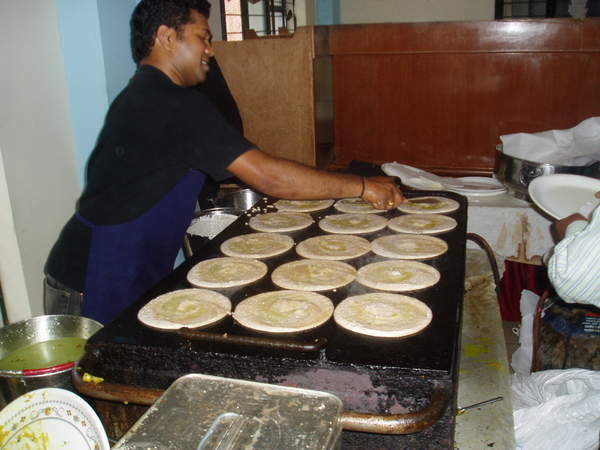 The Sanskrit classic Manasollasa written in 1051 AD by Western Chalukya king Somesvara III describes Dosai. - Modern writers have conflicting views on the origin of Dosa. The English food writer Pat Chapman and Lisa Rayner as well as Indian writer Thangappan Nair state in their works that Dosa originated in Udupi, Karnataka. Their works do not mention the reference to Dosa in Tamil Sangam literature. - Eminent food scientist K. T. Achaya said that Dosa has a history of two thousand years in Tamil-speaking regions. The question is about Masala Dosa - Dosa filled with pototos and onions. The inventor of this masala dosa is purportedly Kadandale Krishna Bhat of Hotel Woodlands, who belongs to the Kadandale village in Karkala Taluk of Udupi district, Karnataka state, India. From what i've heard, its Udupi in Karnataka. Originally Posted by sujith_kochi Somebody knows who invented Masala Dosa? Who, where and when? yes when they are freshly Cooked they are pretty scrumptious. Oooh, one of my favorite foods! And now after looking at that wonderful photo, I'm hungry. I will be eating masala dosas very soon. Good dosas in the picture and with ghee on it. It is one of those knack things, and if you don't have it you end up with a sticky lump of goo. Originally Posted by Nick-H ...but they are! SHOULDN'T be too Difficult. I think the trick is to make sure that the Dosa is well cooked before trying to fold it over. Good luck with that Vandy! It certainly looks like a 'knack' or experience thing to me; also I would imagine thatthe batter needs to be at just the right consitency. I used to make dosa and aaloo-onion sabzi regularly. I have difficulty in making coconut chutney though and am still trying to learn the knack - it looks rather simple, but, getting the correct proportions of coconut, dal is still eluding me ! The omlette type of dosa (thick type) is easy to make. The paper dosas are a diffirent matter altogether. Originally Posted by JOHNLORD The omlette type of dosa (thick type) is easy to make. The paper dosas are a diffirent matter altogether.